This is a very handsome and dramatic Informal Haori, or a topcoat that would have been worn only at home or visiting with very close friends. 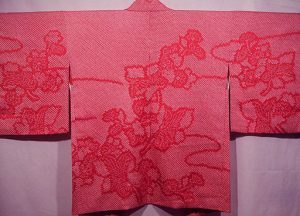 The Informal Haori are often the most luxurious of the Haori as only the wealthiest of Japanese in times past could have afforded to wear such elegant Silk garments in the home. 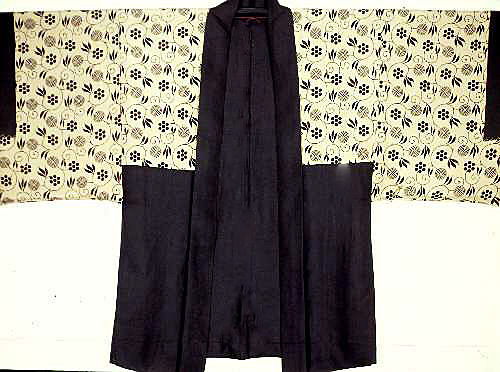 The outer layer of the Haori is hand woven of the finest and most lustrous black Silk. 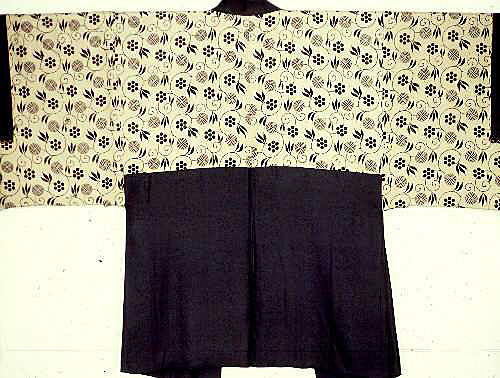 This Haori also has the family’s Crest or “Mon” woven into the upper back on the black outer side of the Haori, indicating that the individual for whom this was custom made was of high social standing. 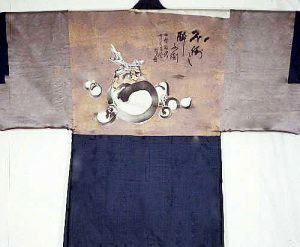 The Crest is that of the Clove or “Choji.” In ancient Japan cloves were one of the most expensive and exotic items imported. 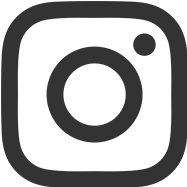 They were highly prized by the upper classes and were thought to symbolize health, comfort, and luxury. 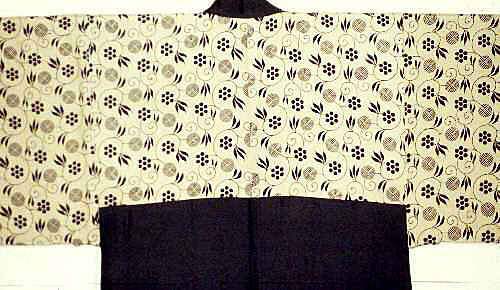 The inner lining of the Haori (shown left) is a sophisticated pattern of black and gold floral arabesque. The word for “arabesque” in Japanese is “Karakusa,” referring to the Chinese plant (“Kara”) which looks foreign to the Japanese observer. This is another sign that the individual for whom this Haori was created belonged to an unusually high level of society as most individuals during the early 1900s were not well enough traveled to recognize this pattern. 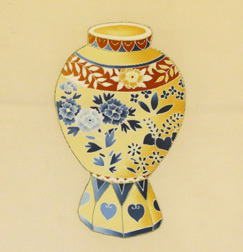 The pattern itself is as old as items in the Shosoin in Nara, Japan’s oldest repository of treasures. 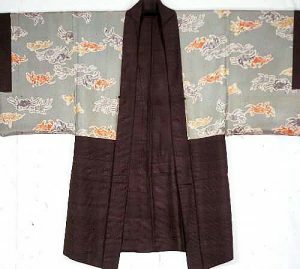 Informal Haori with the inner lining extending completely around the garment, rather than only appearing on the inner back panel…unusual. Lustrous black Silk with inner lining of hand stenciled black floral arabesques on gold Silk in excellent condition. To hang as a display or work of art, or to wear (perhaps with the inside panel on the outside) for a very elegant occasion.